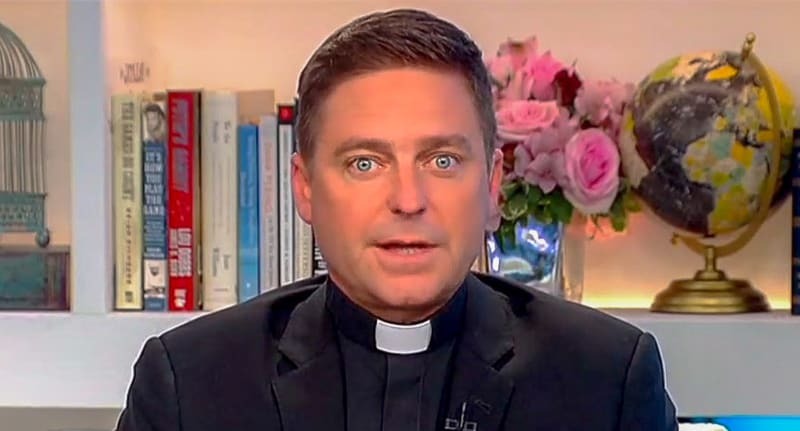 Father Jonathan Morris is a regular contributor at Fox News. He also makes some controversial comments to appease his base. Appearing on Fox & Friends on Sunday, Father Morris explained why Hurricane Florence is part of God’s plan. The far-right news network hosted a segment called “Where is God in a hurricane?” During that segment, host Ed Henry asked Morris where god was when so many people are suffering. “Whether it’s a hurricane or some other hurricane-like reality in our lives, we get to a point where we say, ‘Gosh, where is God? '” Morris said. Even when Fox News host Katie Pavlich shared a story of a mother and baby who were killed after a tree fell on their home, Morris continued to explain his belief. “How do people keep their faith when it feels like the whole world is crumbling?” Pavlich asked. Morris further claimed that other people coming to the aid of their neighbors is all the work of God. It’s not so much that Morris made these statements that are shocking but rather Fox News’ decision to bring god into the equation at all. With massive flooding, a rising death tool, and thousands of lives uprooted, surely Fox News could have found factual news to report from the East Coast. Update: The headline of this post originally called Father Jonathan a correspondent. The headline was updated to reflect his role as a contributor and his discussion surrounding the hurricane and religion.